Have you ever thought about where those cute little Sackboys from PS4 twee-fest LittleBigPlanet go if they’ve lived sinful lives and shuffled off their woollen coils? Nah, probably not. 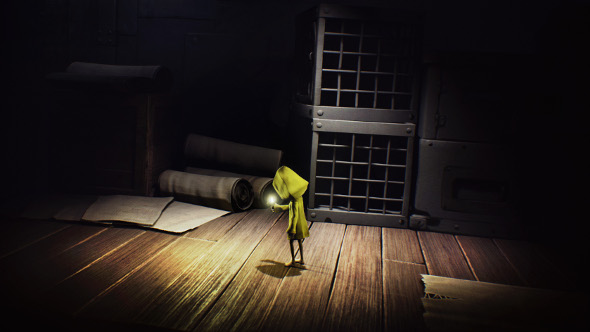 It never crossed my mind either until I played Little Nightmares, the first IP from LittleBigPlanet co-developers Tarsier Studios. Related: a bunch of top-notch PC indie games. 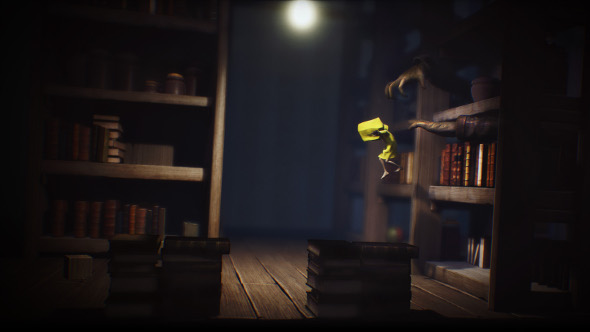 Little Nightmares is like a Sackboy’s hell; a beautiful, chilling platformer capable of sending shivers of dread up your spine at the same time as filling you with admiration for its art style. It’s a sodden, murky mash-up of the darkest LBP creations, Tim Burton, and Coraline (the mysterious protagonist, Six, even wears the same yellow mac). It could also be a modernised take on Grimms’ fairy tales, albeit in their raw, undiluted form before they were sanitised by Disney. 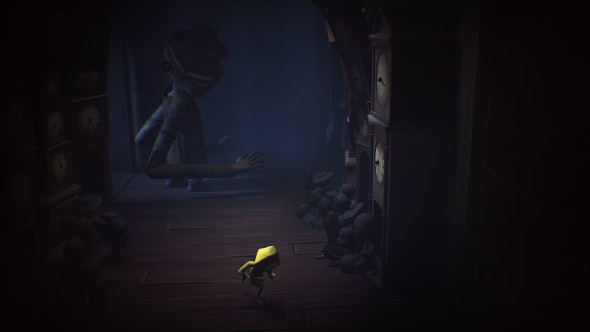 Because despite its twinkly music, physics-based balls and toys, Little Nightmares is not a kids’ game. It’s a game for adults who remember being kids, and the neuroses and nightmares they had at that age – visions of being chased by that freaky doll in your sister’s room, spindly long-armed shadows creeping across the walls towards your bed as you sleep, everything being a little too big for you to ever feel like a master of the space around you. 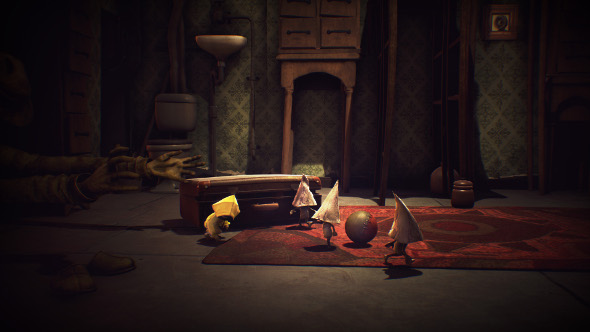 Little Nightmares harnesses all of that in a sort-of 2D platformer format. See, while you generally traverse from left to right and occasionally right to left, there’s an incredible sense of visual depth here, to the extent that you can freely run around in circles if you like. While it looks incredible, it’s not the most ergonomic perspective; during my hands-on I managed to fall to my death twice off the stairs right at the beginning because I misjudged how deep in the environment they actually were. Maybe this feeds into the whole theme of feeling like a child lacking control over its surroundings, but I think that’d be reading a little too much into what’s really a mild mechanical flaw. There’s also scope to get confused by which ledges are grabbable and which aren’t, resulting in several frustrating deaths – capped off each time with the sickening crunch of Six’s ethereal, breaking body. Where this perspective does work, however, is in its relationship with the camera – a voyeuristic, slightly shaky jobby that’s often a little bit askew, making you feel particularly vulnerable when the twiggy heroine is climbing a precarious pile of books or vertiginous filing cabinet. You can control this camera with the right analog stick, scouting the path ahead or – more likely – behind you to check whether one of the game’s creatures is in pursuit. In these situations, the camera acts as the equivalent of turning your head around while you’re running away from your pursuer, and offers some chilling moments – such as when I used it to track a monster sneaking off into the shadows. Let’s talk about those monsters, because my God, what fine, formidable creatures they are. 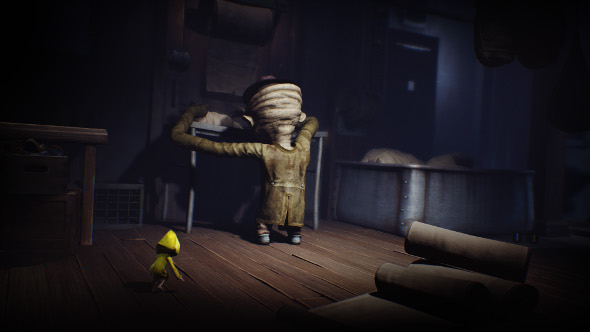 If you’ve been following Little Nightmares, you’ve probably already seen the footage of the saggy-fleshed chef (if you haven’t, try holding off until you can experience it yourself), but my hands-on confronted me with something altogether different, and in my eyes at least, more horrifying. The encounter comes without warning (unless you deem the constant Lynchian humming noise, ghoulish portraits on walls, and silhouette of a hanged man in the foreground to be bad omens). After a couple of rudimentary physics-based puzzles where you put cranks into holes, scale some bookcases, and throw a cymbal monkey at a button, you just about start slipping into a state of semi-comfort… and then you run into Him. His arms are long and spindly, presumably so he can use them as feelers to make up for the fact that he’s blind – demarcated by the filthy bandage wrapped around his head. His senses of smell and hearing make up for his weakness, and a single sweep of the ground with his arms can quickly be your undoing. Even though he’s 20 times your size, his pathetic posture means you never fully see his face, though look closely and you can just make out his withered old jaw, top teeth gurning and chewing at his overbite. There is definitely a sense of tragedy about ol’ Spindly Armslong – he listlessly plays around with books and things lying on the ground as if he may have once understood their meaning, but it now eludes him. His dreary brown outfit, with its undersized homburg and oversized coat (his legs are so short that he almost resembles an upper body pulling itself around using only its arms), makes him look impoverished and desperate – if he wasn’t gigantic and murderous, you’d want to take him to the nearest hostel. 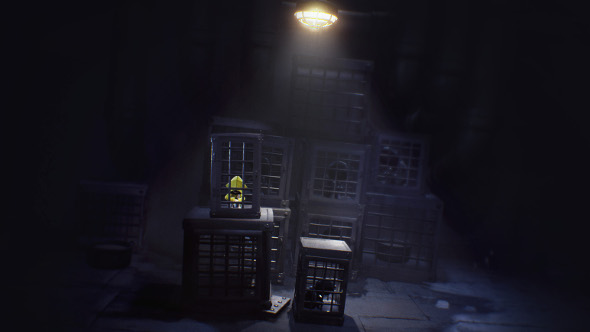 The Maw, as the setting of Little Nightmares is known, feels like a place where junk belonging to people now dead is stockpiled. One room is lined with grandfather clocks, another with dolls, and I’ve already mentioned the piles of books lying around. In one sequence, you’re running through a room where shoes are raining down from pipes in the ceiling, forcing you to wade through them. Here you’re chased by some unseen creature swimming through the shoes after you (to the sound of eerie gramophone music). I wasn’t the only one to think of the infamous shoe room at Auschwitz here, and while I don’t think this game’s trying to be some kind of allegory for that particular tragedy, it still manages to unsettle. You get a sense that there’s something more going on here than just thematic darkness for its own sake. But what’s happening behind the scenes is pure speculation. All we really know is that you are a girl who’s been kidnapped and put to work in this grim underworld at the bottom of the ocean, where these bizarre humanoids serve the needs of a rich over-class that presumably lives in decadence many miles above them. It makes you wonder, are these maimed creatures really the bad guys? Whatever the case, there’s enough moment-by-moment tension here that you don’t need to trouble yourself with the bigger picture if you don’t want to. In one of those moments of mesmerising horror, I’m wandering through a library, thinking I’ve got away from ol’ Spindly. The book aisles stretch off from the foreground into the background, exhibiting some of that impressive sense of depth I talked about earlier. Suddenly, I see movement in the background of an aisle I just passed, then in the next aisle I see his outline in the misty, soft-focused background, his arms stretching between the two bookshelves almost like a spider in a web. He moves on shortly after that, maybe because he didn’t notice me or maybe because he’s thought of a more cunning way to get me, but it’s one of those excellent, snapshot images that continues to haunt me.